(Nanowerk News) By producing some of the highest resolution images of peptides attaching to mineral surfaces, scientists have a deeper understanding how biomolecules manipulate the growth crystals. This research may lead to a new treatment for kidney stones using biomolecules. Aspartic acid-rich peptides adsorbed on a calcium oxalate monohydrate (COM) crystal surface. 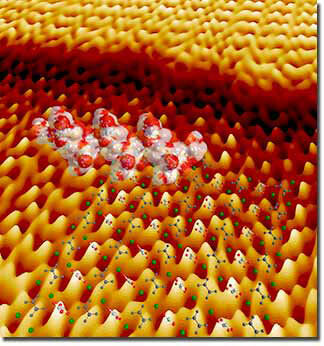 Models of a peptide and COM crystal structure are overlain on an AFM image collected during growth of the  face of COM. The rendered AFM image reveals the molecular structure of the crystal surface including individual kink-sites along a single atomic step. The high peaks show the individual oxalate groups and the dimension along the bottom edge of the image is 60 angstroms.